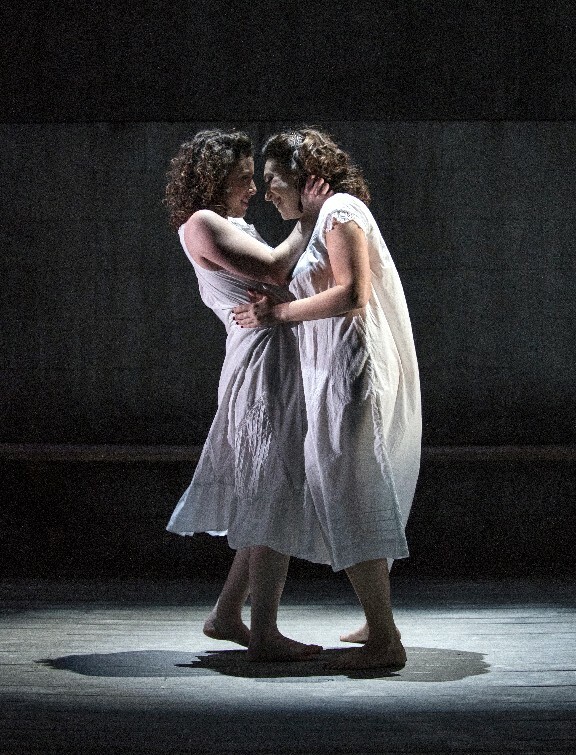 Conceived and originally directed by Rebecca Taichman, the 100-minute one-act drama with music chronicles a play called God of Vengeance--originally written in Yiddish by Polish Jew Sholem Asch--that saw its 1923 Broadway cast arrested due to a lesbian love scene. 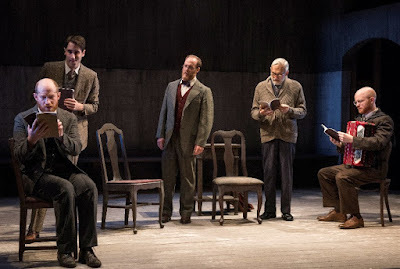 With a fine, agile cast rotating through various roles to document the development of God of Vengeance going back to Asch's first draft in 1906, Indecent--directed here by the terrific Gary Griffin--nicely weaves in several Yiddish songs played by onstage musicians (including a pre-show quartet). While touching on weighty matters including artistic freedom, homophobia, anti-Semitism, censorship and the Holocaust, Vogel deftly moderates the pathos with the inclusion of music, humor, love and plentiful, oft playful, references to the Yiddish language prominent among Jews in Poland, Germany and elsewhere during the period depicted. Having never heard of Asch or God of Vengeance, and intrigued by explorations of homosexuality long before it became widely accepted--to whatever degree it has--I appreciated the cultural history lesson of Indecent, and the acting is assuredly first-rate. God of Vengeance is about a Jewish brothel owner (played here within Indecent by the always terrific David Darlow, who is simultaneously depicting an actor named Rudolph Schildkraut), whose chaste daughter becomes involved with a prostitute (Kiah Stern and Catherine LeFrere are respectively excellent, also in handling multiple roles beyond the play-within-the-play). Rather than focusing as acutely as I would have imagined on the 1923 Broadway run that resulted in the show's closure when the cast and producer were arrested--actually 6 weeks into the run, which Indecent doesn't mention--Vogel thoroughly delineates the life-cycle of God of Vengeance dating back to its genesis years earlier. This is certainly of some interest, as we learn how the newly-married Asch (Noah LaPook) came to write the play, showed it to members of the Polish-Jewish intelligentsia, gained the enduring support of a man named Lemml (Benjamin Magnuson) and had it produced multiple times in various places before the Broadway production. But perhaps because of such diffusion in reaching the crisis point, I largely observed and appreciated Indecent, but too rarely--per what I consider an arbiter of optimal artistic brilliance--felt it. I also would have valued learning more about societal--and Jewish and theatrical--mores about homosexuality in the early 20th century, rather than having the outrage over God of Vengeance ascribed mainly to the uptight well-heeled families that significantly comprised Broadway patronage at the time. 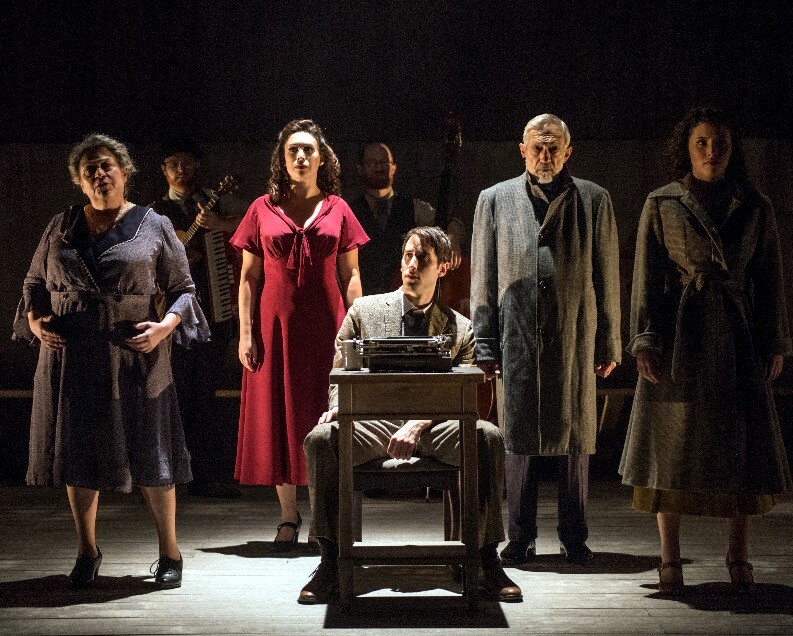 Indecent is certainly anything but, and Victory Gardens' production is terrific. 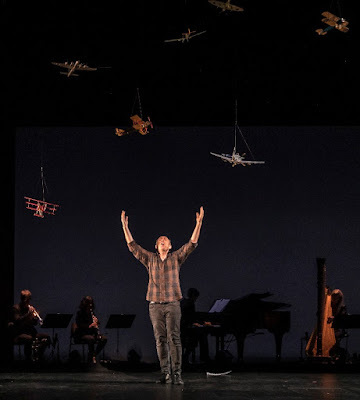 A standing ovation was deservedly bestowed on opening night, and I wouldn't be surprised or chagrined if some critics and patrons like this play far more than I did. The difference between estimable, excellent and truly outstanding is inexact, intangible and, as I alluded above, often more about emotional embrace than cerebral assessment. I'm happy for my first exposure to Vogel's work, can readily appreciate considerable skillfulness in the subject, structure and music of Indecent--music director Matt Deitchman clearly deserves kudos--and am glad to now know of Sholem Asch and God of Vengeance. But although Indecent definitely isn't schlock, and depicts considerable chutzpah, I can't quite kvell. And while I may well be a schlub who likes to kibitz without knowing bubkes, that's my shpiel. Especially at this point in my life, I don't think I would really enjoy attending one of the big UK rock festivals: Glastonbury, Reading, Leeds, Isle of Wight, etc. But I've always loved seeing video of these vast gatherings, especially when the massive crowds sing along to favorites from the British Isles. Obviously, huge festivals are not native to the UK--I've attended multiple Lollapaloozas and Riot Fests in Chicago and elsewhere, though not anymore except for Milwaukee Summerfest, which is a bit different--and, as everywhere, American and international artists are also represented. But I've long had fascination with and affinity for English/Irish/Welsh/Scottish bands that become UK superstars while remaining relatively unknown in the U.S. In 2006 I even compiled an 8-CD boxed set of such acts--The Move, The Jam, Blur, Razorlight, Robbie Williams, Kasabian, Kaiser Chiefs, etc., etc.--that I titled Hidden in the Isles. 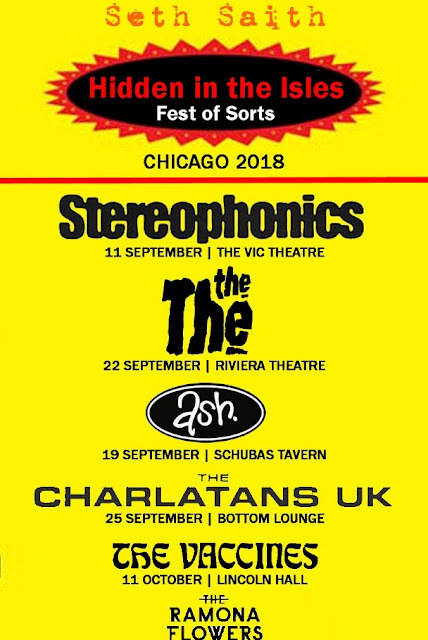 To round out the day with a bit of modernity, we could also add The Vaccines--who I'll be seeing Oct. 11--and The Ramona Flowers, who I enjoyed opening for the Stereophonics. Between them, these bands have had twelve #1 albums in the UK and 31 that have hit the top 10, yet none that have charted above #73 in the U.S. (with the vast majority never hitting the Billboard 200). 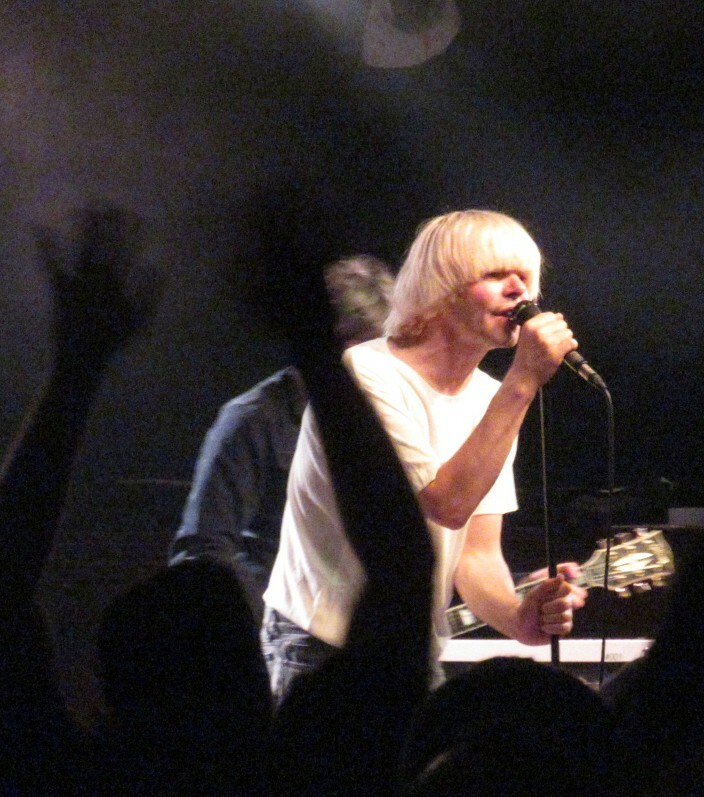 I don't remember exactly when I got into The Charlatans UK--so-suffixed due to an old U.S. band with the same name--but it wasn't around the 1990 release of Some Friendly, which was the album that hit #73 here. 1997's Tellin' Stories--which hit #1 overseas but didn't chart here--was the first Charlatans album I owned (though I don't recall when or why I discovered it) and it remains my favorite. 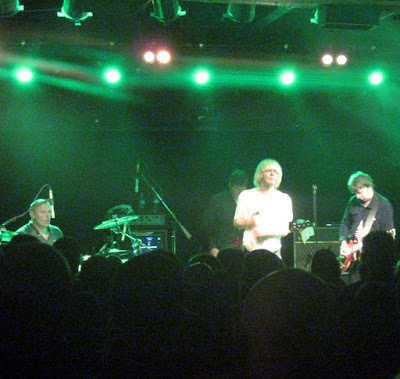 The Charlatans were initially part of the "Madchester" scene along with the Stone Roses, Happy Mondays, Primal Scream, James and the like, but I really don't think I knew of them until well after Oasis exploded out of Manchester later in the '90s. 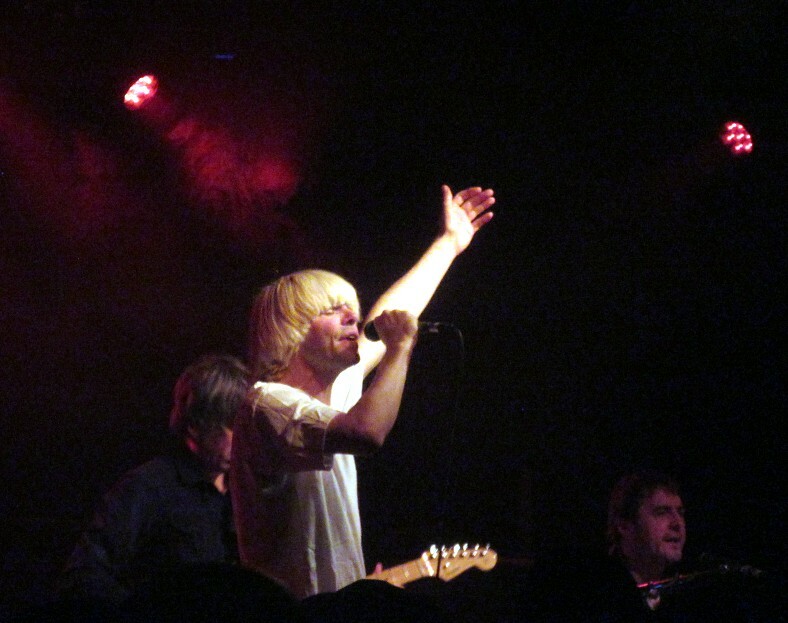 The band has had some lineup changes due to the tragic deaths of Rob Collins (in 1996) and Jon Brookes (in 2013), but remains largely intact with singer Tim Burgess, guitarist Mark Collins and bassist Martin Blunt all in tow since the early '90s. Keyboardist Tony Rodgers is also a 20+ year member, but I can't cite with certainty the current drummer. I had seen the Charlatans once before, in 2006 at the Vic, and while I don't like them quite as much as Stereophonics or Ash, nor Blur, Pulp or Oasis for that matter, I've enjoyed several songs over the years. Admittedly, I didn't thoroughly devour their past two albums when released--last year's Different Days, from which "Plastic Machinery" did make my "Best of 2017," and 2015's Modern Nature--but studied up on Spotify in noting recent setlists. 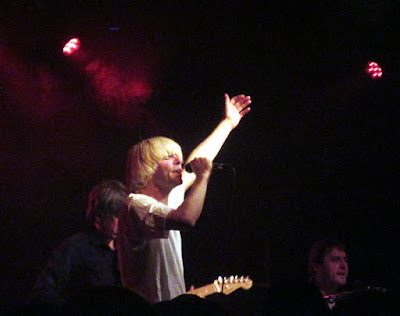 That 11 of 19 songs played at Chicago's Bottom Lounge came from these two albums bespeaks the confidence the Charlatans have in their material released since the loss of Brookes, and songs like "Emilie," "Let the Good Times Be Never Ending," "Different Days," "Come Home Baby" and "So Oh" joined "Plastic Machinery" in showing they still create fine music. Burgess is a fun frontman with an excellent voice, and the band certainly did perform some prime old stuff: the highly charged "One to Another," the piano driven "Just When You're Thinking Things Over," "The Only One I Know," "Weirdo" and "North Country Boy." So it was a good show, especially as the SRO Bottom Lounge kindly provided me a place to sit upon request. I arrived a bit late to see all of the opening act, Frankie, but enjoyed what I caught of the all (or perhaps mostly, as I couldn't see everyone onstage nor find them online) woman band. Yet it wasn't quite a phenomenal concert, in part perhaps due to a bit too much new stuff, at least for my tastes. I had sent a tweet to Burgess a few days before the gig politely requesting that the Charlatans play "Blackened Blue Eyes"--a fantastic song from 2006's Simpatico--in Chicago. Though he kindly "liked" my tweet, my request wasn't honored, which I respect. The band should play what they want. 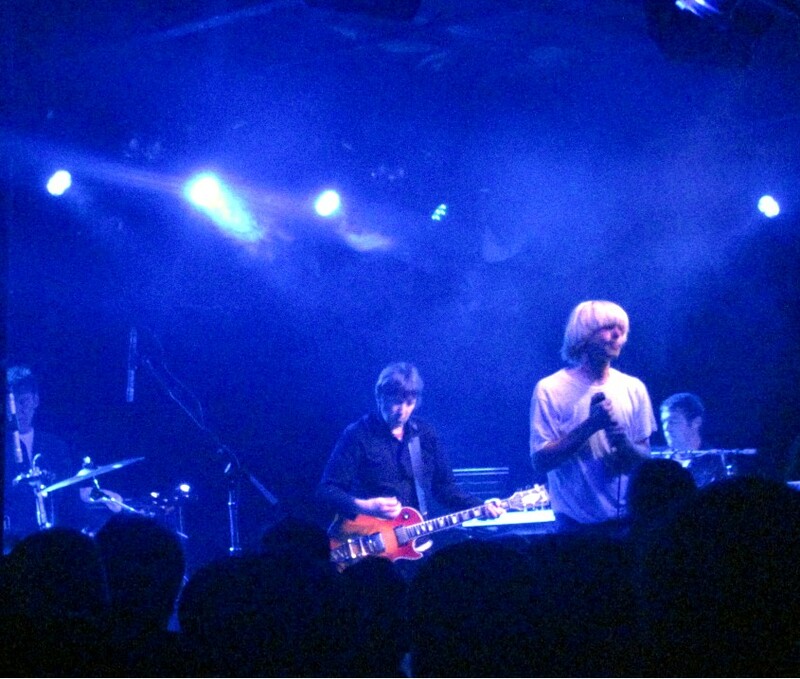 But the concert could have used that tune's punch, and two other songs that would make my Charlatans Top 5 (along with it, "One to Another" and "Plastic Machinery")--"How High" and "With No Shoes"--were also eschewed. 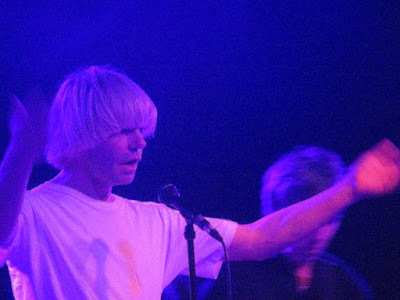 Thus--but not only due to these omissions--I didn't find the Charlatans' performance quite as delectable as those by Stereophonics and Ash. But as alluded above, that was unlikely coming in, and I'm not saying the show was disappointing. I very much enjoyed it, and Burgess and the band sounded terrific even if I might have relished a few different songs. longer setlists and far greater creature comforts. While it would likely be blissful to sing along to "One to Another"--and "Local Boy in the Photograph" (Stereophonics), "Girl From Mars" (Ash), "This is the Day" (The The)--alongside 100,000 other music fans, not having to stand in a (possibly rainy & muddy) field all day, being right up close to the stage, having ready access to clean restrooms, food & drink and getting home easily makes my own private Glastonbury even better than the real thing. 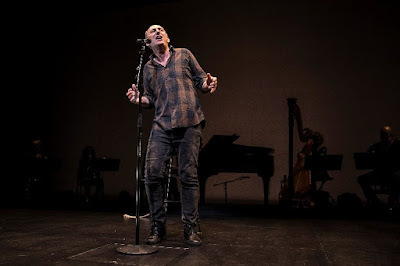 I keep a database of every live non-athletic performance I attend: rock concerts, plays, musicals, jazz, classical, opera, ballet, stand-up comedians, sketch comedy, improv, Cirque du Soleil, the occasional magician, etc., etc. Not counting a few childhood trips to the circus, college-credit theater and some other stuff that--due to inexact memory or the lack of a ticket stub--never made it into my database, I'm now closing in on 2,000 shows seen in my lifetime, with the vast majority coming since the year 2000. Aside from solo concert performances, I've attended a handful or two of one-man or one-woman shows, including Billy Crystal's 700 Sundays, Chazz Palminteri's A Bronx Tale (different than the musical based on the movie), Carrie Fisher's Wishful Drinking, Buyer & Cellar with Michael Urie and George Gershwin Alone by and starring Hershey Felder. But, as recorded in my trusty "Shows Seen" database, I've seen just two performances I would dub a "Memoir with Music." The first, last December, was Springsteen on Broadway. Still running until this December, the show features Bruce Springsteen telling largely-scripted tales of his life and career, accompanied by about 15 songs performed on guitar or piano, alone except for two on which his wife, Patti Scialfa, joins him. Springsteen is my favorite performer of any ilk. 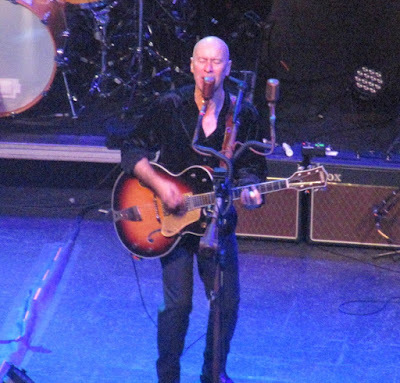 Since around 1980, I have been a huge fan of his music--including that which came before--so I own essentially everything he's every released and have seen him in concert 50 times (mostly with the E Street Band alongside). I even once met him at book signing, albeit quite briefly. I know pretty much all of his songs, and all of the lyrics, and in one form or other had heard or read most of the recollections he shared in Springsteen on Broadway. Yet I absolutely loved that show, simply as theater. 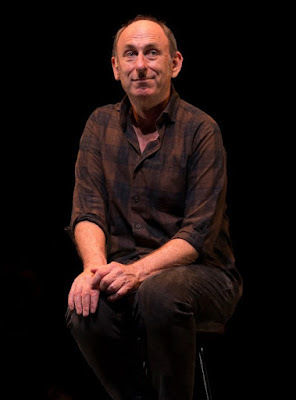 The other Memoir with Music I've seen came Monday night at Goodman Theatre, where the current mainstage production is We're Only Alive for a Short Amount of Time, written and performed by an English actor, singer/songwriter and monologuist named David Cale. Although the show program reminded that Cale wrote and co-starred in Floyd & Clea Under the Western Sky--a quirky musical I really liked at Goodman in 2005--for all practical purposes, I knew nothing about his life and career. The program further revealed that Cale has had an artistic relationship with the Goodman for three decades, starting with a solo performance piece called The Redthroats in 1988. But I have not seen him in anything other than Floyd & Clea, including never knowingly on TV. Though Cale appears quite accomplished per his About the Artists credit list, he seemingly is not famous enough to have a Wikipedia entry (unless he scrubbed it to keep secret personal details revealed in the current monologue). My point is that, as opposed to Springsteen on Broadway, this memoir with music was by someone I didn't enter caring about, nor who was well-known by the public (though perhaps more so by longstanding Goodman patrons). 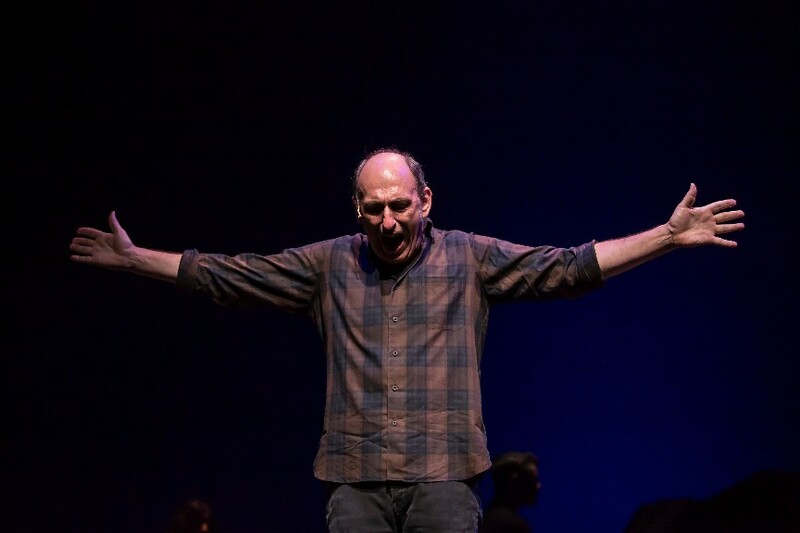 Like the long-famed rocker, Cale is an engaging and erudite communicator who commands the stage well, even without any sort of video accompaniments (as directed here by Goodman Artistic Director Robert Falls). He doesn't have a great singing voice, but his songs are filled with pathos, which is what many might claim about Springsteen. 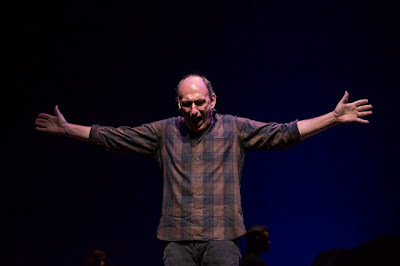 At the very least, I would say We're Only Alive for a Short Amount of Time is good for what it is, and though I didn't enjoy it nearly as much as Springsteen on Broadway (my review) it is worthwhile as a unique work of theater. Toward the end of the 90 minutes, Cale's monologue became quite gripping as he told about a dark episode in his life, one that presumably no one could hear without considerable emotionality. 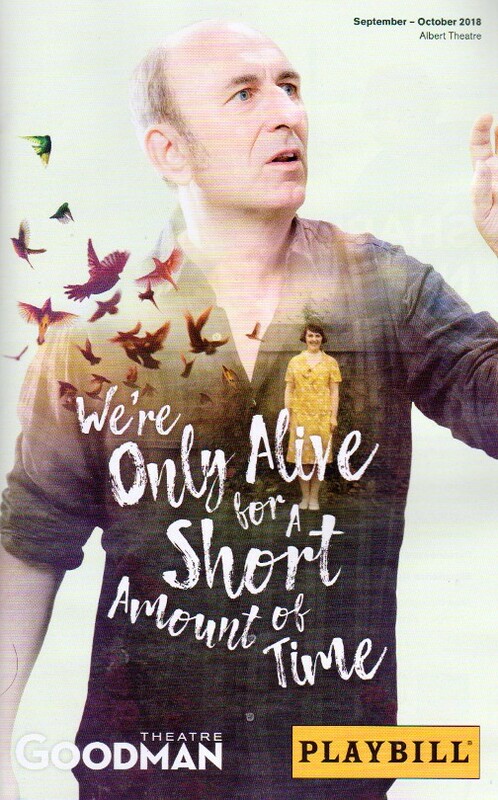 But for much of the show, as Cale talked about growing up in Luton, a crime-ridden city fairly close to London, and how as a child he maintained a menagerie of tropical birds in his backyard, I listened without really learning why I should care about this particular man's life story. He had a brother, Simon, and one or both of his parents worked in a hat factory--I wasn't quite clear--and Cale discovered he liked boys but also valued friendships with women, including one who loved Joni Mitchell. But while I was engaged throughout, I wasn't that engaged for the entirely, perhaps because I didn't know where Cale's tale was leading--within or beyond this presentation. 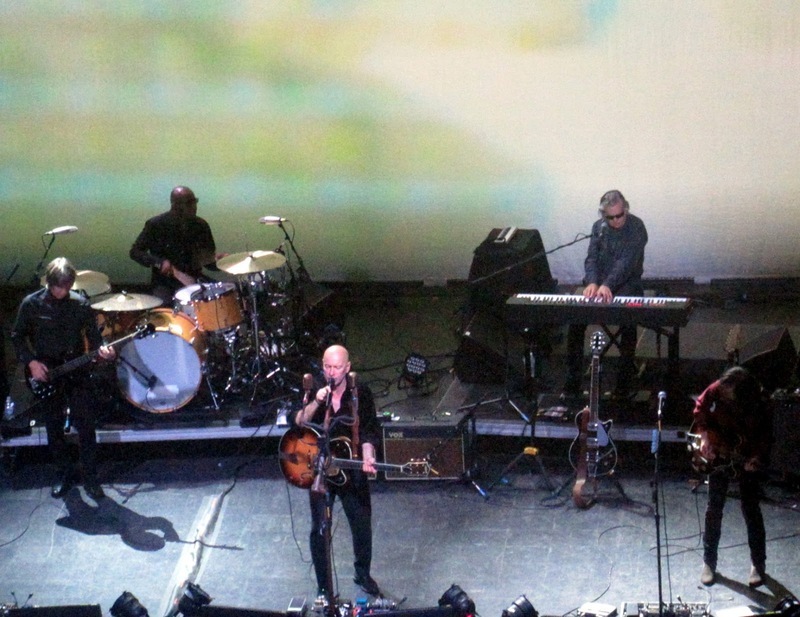 A dozen songs are sung, backed by six musicians behind a scrim, including musical director and Cale's collaborator, Matthew Dean Marsh. My favorite tune was one called "Simon," regarding Cale's brother. Eventually, there is an anecdote about Liza Minelli, and some rather gripping revelations I won't detail. 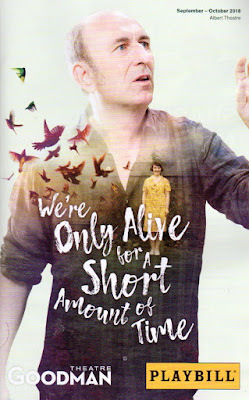 I see that We're Only Alive for a Short Amount of Time--not really the best title--is getting far more glowing reviews than this one, and while I can't quite concur, I won't contradict them. As @@@1/2 denotes, I found the show to be well-done, and it eventually became riveting. But with no slight meant to the considerable talents of David Cale, for me it just wasn't quite the boss. 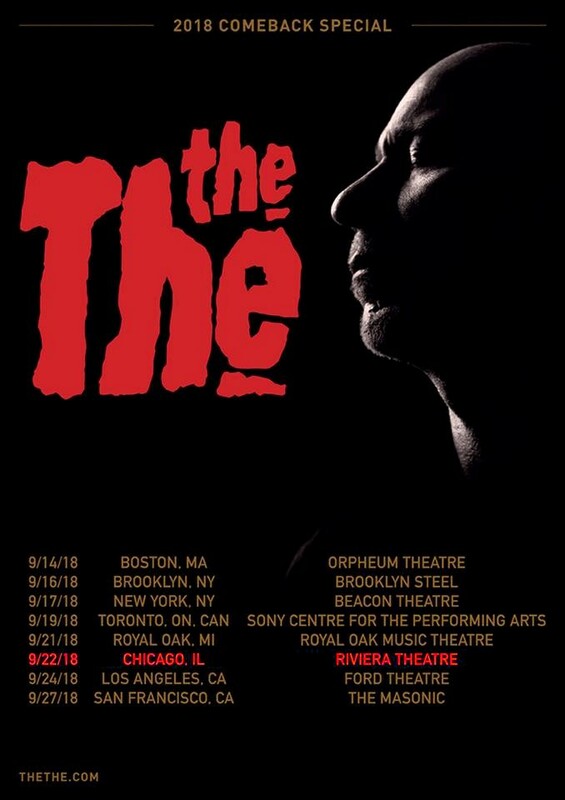 This will undoubtedly sound like the insipid nadir of music criticism, but I think bigger fans of the The enjoyed were apt to enjoy their Comeback Special tour stop at the Riv far more than I did. Obviously, this true at most concerts, with greater inherent affinity abetting the live experience. But though I enjoyed the The's show far more than I didn't, the truth is that I've never been much of a fan of the enterprise that has been essentially English singer/songwriter Matt Johnson and various collaborators over the years. This isn't to say I had a knowing aversion, I just didn't--despite being aware of the quirky name and cognizant years ago of a friend's fandom--ever come to know much the The music. Before I started Spotifamiliarizing myself for Saturday's show--based on setlists this summer that largely held--only "This is the Day" was readily familiar, probably from its use in TV, movies and commercials. "Uncertain Smile" and "Infected" were vaguely so and nothing else really was. When the The's first Chicago show in 25 years--if Setlist.fm can be trusted, for although there was a 2000 tour, it seemingly didn't hit these parts--was announced in the spring, my pal Paolo (a different friend than the one cited just above but also a rather ardent fan) suggested I join him. 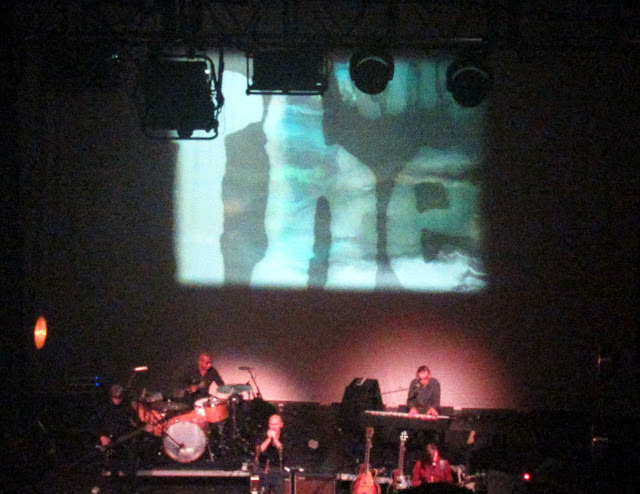 In recent years, I've made a point of seeing several artists I'd never seen previously, particularly among the British '80s New Wave: New Order, Duran Duran, Erasure, Pet Shop Boys, the Church, Echo & the Bunnymen, the Jesus & Mary Chain, Johnny Marr and others. I don't know how properly the The fits into this classification, but it's not like they needed to in order to pique my interest, and I agreed to accompany Paolo. In recent months, and especially weeks, I started listening to what I thought might get played, so by showtime I was pretty familiar with most of the songs, at least sonically. But this I realize, is far different than knowing the The's catalog historically or innately. I wasn't familiar with the Soul Mining album from the time it was released in 1983, and unlike for one of my pals, 1989's Mind Bomb--with songs like "The Beat(en) Generation" and "Armageddon Days Are Here (Again)"--didn't accompany a still-thriving courtship. So for me, this Comeback Special didn't signal the return of an act I'd loved in my teens--or my 20s, 30s or 40s for that matter--but rather a band (and chief impresario) I'd been given reason to respect, yet didn't inherently relish. And even though there was clear quality in several of the songs I had come to know, for the most part I wouldn't say I quite loved them. 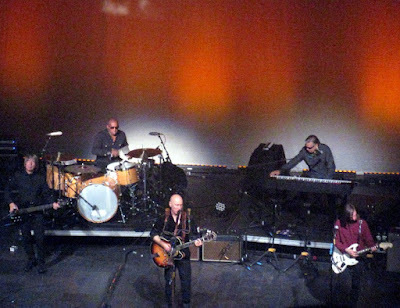 The The's sound seems to be more one of muted observation, rather than melodic lilt or--as I truly prefer--crunchy guitar-driven urgency. With due respect for anyone who makes music upon a stage, Saturday's show was not greatly abetted by opening act Agnes Obel, a Danish singer accompanied by another female keyboardist and two cellists. Some of the music made was pleasant enough, but while atonal probably isn't a fair word, it was so melodically subdued as to make the The akin to Rolling Stones in comparison. 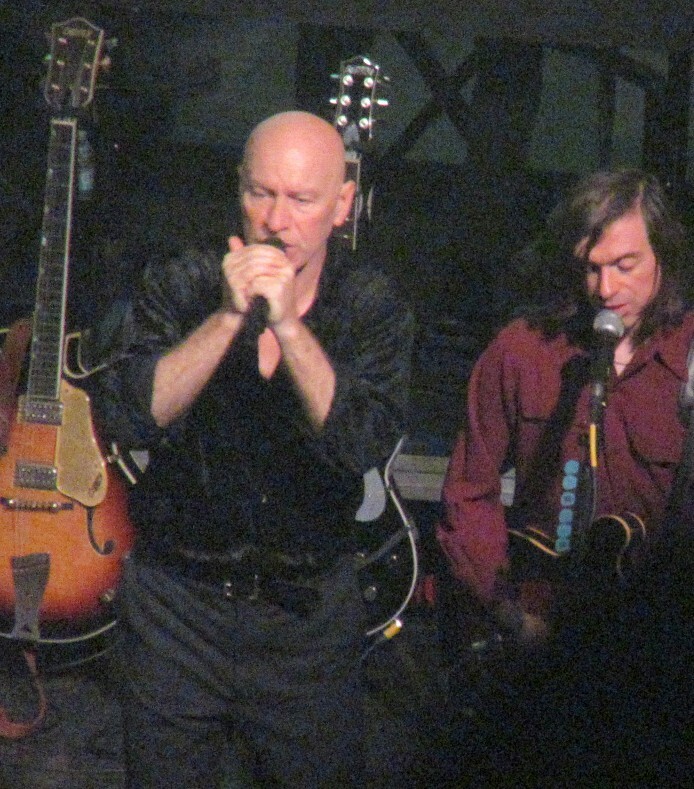 But they aren't the Stones, and though amiably articulate, Matt Johnson isn't Mick Jagger. As the lights rose so too did the tenor of the music, and a few songs in the trio of "Heartland," "The Beat(en) Generation" and "Armageddon Days are Here (Again)" was undeniably enjoyable. Earl Harvin added some powerful drumming to "Beyond Love," and his thunderous intro to "Infected" much later on was another highlight. 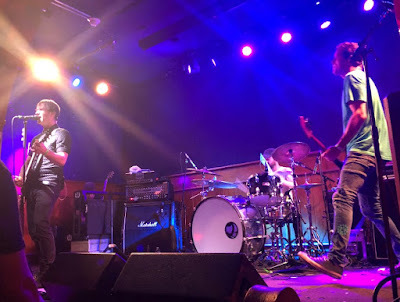 I don't think there's much wrong with seeing a band I hadn't really known, hearing songs I predominantly like more than love, thinking it was a quality but not astonishing show and awarding a solid @@@@ (on my 5@ scale). I was contented in my expenditure of time and money to see the The, and while I'm not sure I need to see them again--heck, I could be nearly 70 before provided another chance--I'm glad I'm more aware of Johnson and his oeuvre. My sense from some other fans sitting near Paolo and me in the Riviera balcony--admittedly not the early birds--was that they probably appreciated the show on a similar level. But having heard from friends who dubbed it a great show, I felt I should qualify why I probably didn't attend with the same inherent anticipation. Which to some degree, lends itself to why--despite enjoying the The show--I can't effuse to that extent. But quite honestly, I love when people love a concert far more than I. On this blog, I share my opinion about almost any show I see--regardless of the fervor of my fandom beforehand--and I'm not looking to convince anyone of my opinion. And I can clearly recognize how, for some, the long-awaited return of the The was a sentimental, special, perhaps even holy occasion, and I've experienced enough of those to be happy even if I didn't this time. 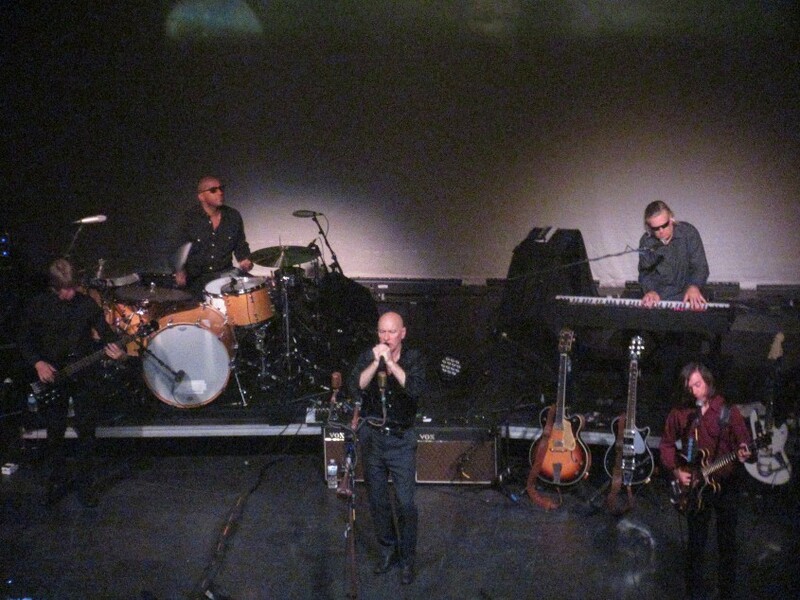 Interestingly, though, after the The finished playing, I asked Paolo--again, a much more avid, longstanding fan than I--how he would grade it on a @@@@@ scale. He related having seen the The with a larger, more symphonic lineup and soundscape in the past, and agreed that "This is the Day" didn't feel as blissful as hoped. So maybe I'm not showing my callowness all that much in thinking it was a good show by a quality act making a welcome return, but perhaps not quite the The greatest thing ever. In Rachel Bonds' Curve of Departure, the seemingly central character is an elderly man named Rudy, who--as played at Northlight by the remarkable 94-year-old Mike Nussbaum--can't help but seem "with it," cool, bemused and sardonic. Yet within the New Mexico motel room--designed perhaps a bit too impressively by Lauren Nigri--where Rudy stays before attending his son's funeral the next day, we learn that he is disappointed by his failings as a father, losing control of both his mind and his bowels, and fairly lucidly contemplating ending his life. 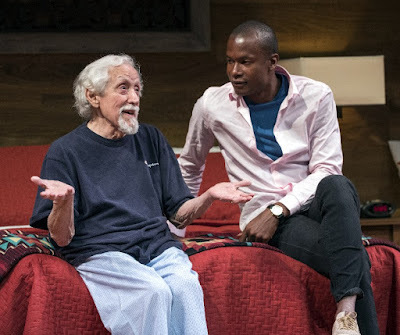 That Rudy's concerns and Nussbaum himself wind up not being the most compelling aspects of a four character play lasting barely 75 minutes bespeaks Bonds' ability to niftily immerse us in a simple setup with situations that feel quite real. 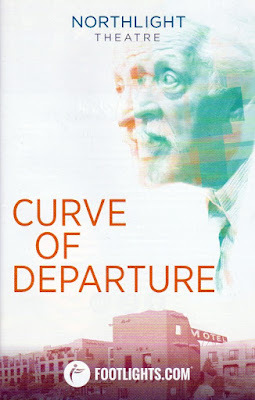 Curve of Departure is well-worth your time, and if you're already planning to see it--or if I've already convinced you--you may very well wish to stop reading this review right here, at least until afterward. 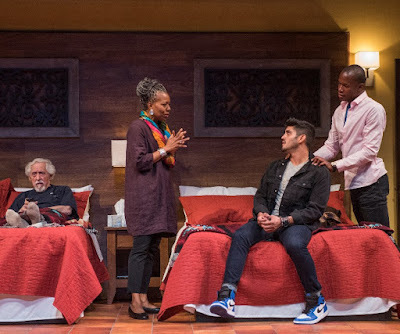 For while, as always, I'll try to be circumspect about narrative details, from the play's outset I was unclear as to the exact connection of Linda (an excellent Penelope Walker) to Rudy and why she is there in his motel room. This really isn't any kind of narrative mystery, and in just loosely describing the characters I will have to give an explanation without much guilt, but if you'd rather just approach it cold, again, STOP READING. Whereas I thought Linda might be Rudy's wife, daughter or an unrelated caregiver, she is actually his former daughter-in-law, long divorced from his son Cyrus--who they are to bury--yet has seemingly remained quite close to Rudy over the years. Linda is also the mother of Rudy's grandson, Felix (Sean Parris), who arrives at the motel with his boyfriend, Jackson (Danny Martinez). Both actors do strong work. Due to financial realities, the four all spend the night in the same room, which doesn't seem quite as cramped as it probably should. I'll let you discover the sleeping arrangements. There is also an intriguing twist concerning Felix and Jackson that I won't detail, but some of the conversations--and understandable complexities--surrounding it are what truly make Curve of Departure most beguiling. 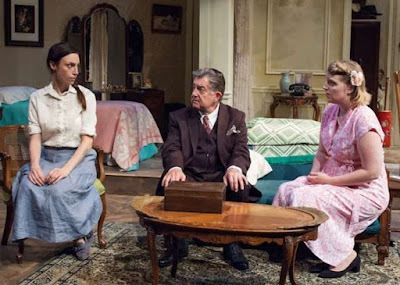 To be honest, there are reasons I thought the play--while certainly of considerable quality either way--might merit @@@@ rather than @@@@1/2 on my 5@ scale. Bonds' script is rather light regarding Rudy's relationship with and grief over his son, and Linda's likewise with her ex-husband (both the same, never seen Cyrus). And while several of the realistic-feeling complexities are quite intriguing, in a few cases it seemed like Bonds--and/or the director here, BJ Jones--might have even more powerfully put the pedal to the metal. 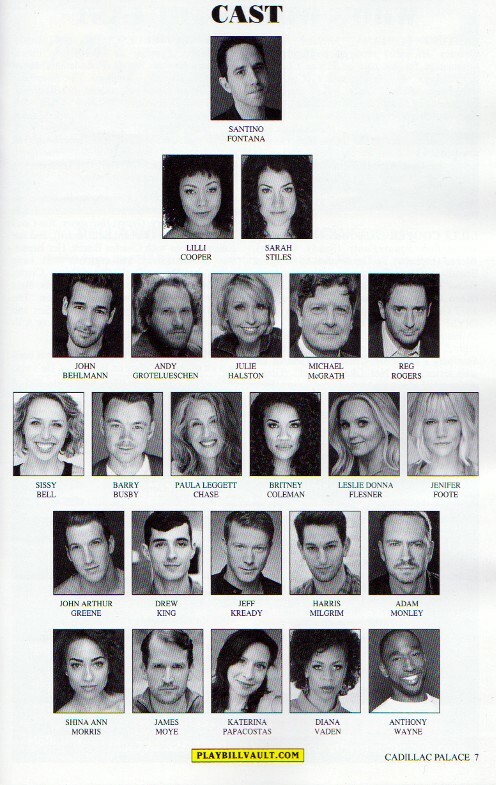 I don't have a problem with the play's brevity on principle, but another 15 minutes could have been well used. Yet while Curve of Departure might conceivably be even better, as it stands, I really enjoyed it. Nussbaum is always a delight, a force and freak of nature. Normally he would be the emphasis of a review, as in Relativity and Freud's Last Session. That even in being his incredible self, there are even greater reasons to recommend this slice-of-life--abundant with challenging complications but also considerable love--well, that really is quite a Curve. I've pretty much written this review before. Not so much specifically about Ash, the hard-rocking Irish trio I've loved since discovering them--pretty much in real-time--through the stellar soundtrack for the so-so 1995 film, Angus. 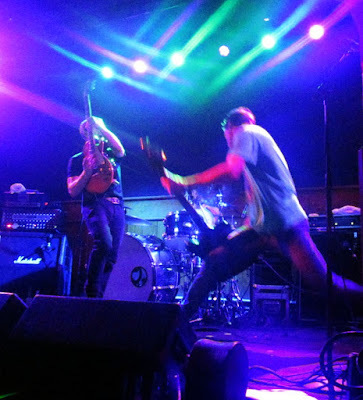 Though I similarity lavished praise on Ash's 2013 and 2016 shows at Chicago's Lincoln Hall--I also saw them three times previously--the gist of my thoughts about Wednesday's gig at Schubas's was actually expressed just last week. Like that Welsh band, Ash has been far more popular in the UK than in the U.S.
Their 1996 debut album, titled 1977, topped the British charts--as did 2001's Free All Angels--and is considered one of the greatest albums in BritPop history. While I sense their overseas popularity has somewhat subsided--and perhaps never quite matched the heights reached by the Stereophonics--I believe Ash remains a well-known entity who can delight large festival crowds across the pond. 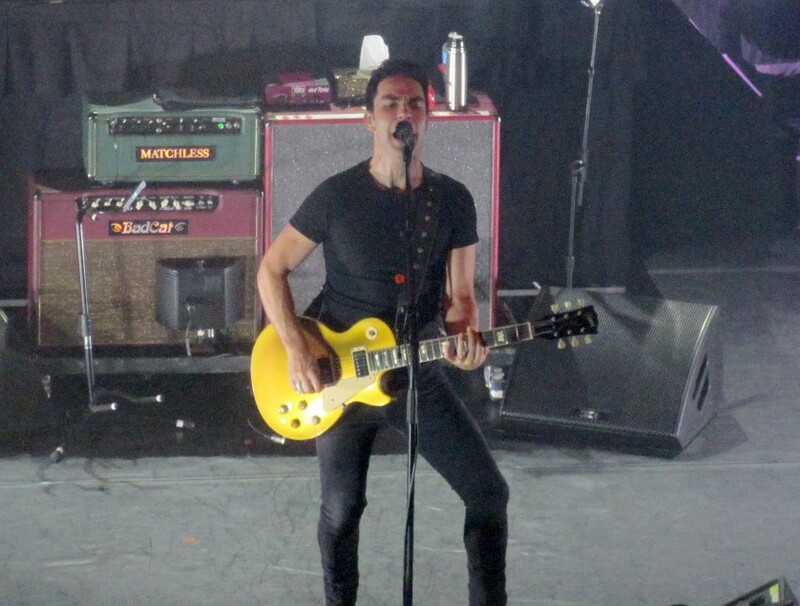 But as I wrote about the Stereophonics, American music fans have largely been oblivious to Ash, relegating them to playing relatively tiny venues compared to back home. This doesn't matter to those of us who enjoy their music, or even seemingly the musicians, who definitely seem to bring their all despite--in Ash's case--playing a non-sold out show at Schubas, which only holds about 150 people. The concert came 8 days and four blocks west on Belmont Avenue from the Stereophonics blistering the Vic Theatre, which holds 1,000 people but was also well short of sold-out. 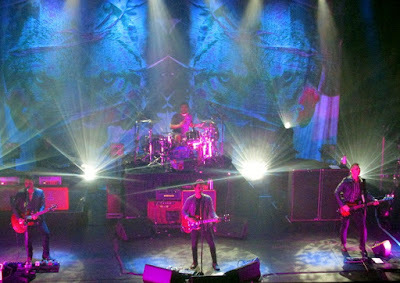 I like the Stereophonics a bit more overall, and in playing an hour longer than Ash's 90 minutes, their show was slightly more pleasing. Until I noticed in recent weeks that they were booked into Schubas, I hadn't been aware that Ash released a new album, Islands, in May. But even in giving it just a few listens, many strong songs were apparent, and from the show opening "Buzzkill" to "True Story," "Confessions in the Pool," "Annabel" and "All That I Have Left," the new material impressed alongside the old. The same three guys--singer/guitarist/chief songwriter Tim Wheeler, bassist Mark Hamilton, drummer Rick McMurray--have been in Ash since 1992, when they were all teenagers. So virtually all of their songs have a similar punk-pop sound without out much instrumental diversity, and though I love it, the lack of variance is why 90 minutes was plenty and why I don't consider Ash quite up there with the Stereophonics or some of the truly all-time great bands. But they are terrific at what they do, and with the three old friends now into their 40s, there doesn't seem to be any notable dropoff. Songs from 1977--"Goldfinger," "Kung Fu," "Lose Control," "Oh Yeah," "Angel Interceptor" and especially "Girl From Mars"--remain sheer delights, and tracks from across 8 albums demonstrated that Wheeler and Co. have always been able to write a catchy tune. "Jesus Says," "Orpheus," "Jack Names the Planets" and the closing "Burn Baby Burn" were a few other highlights, but pretty much everything was. The generally SRO Schubas graciously accommodated my request for a seat, and being right up by the stage made for a fantastic night. 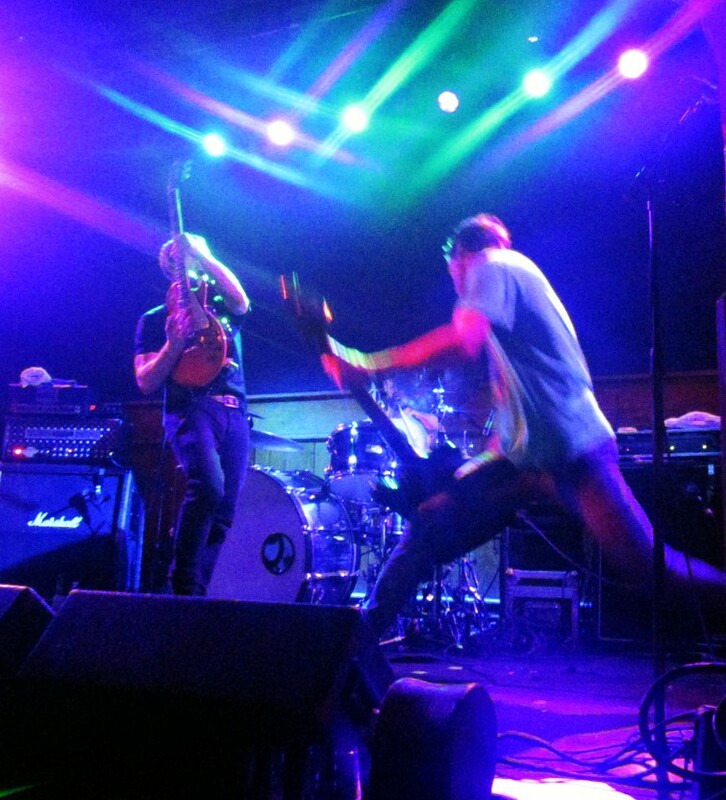 A Chicago band called Namorado opened the show, and though nothing in particular stood out to me, they acclimated themselves well. 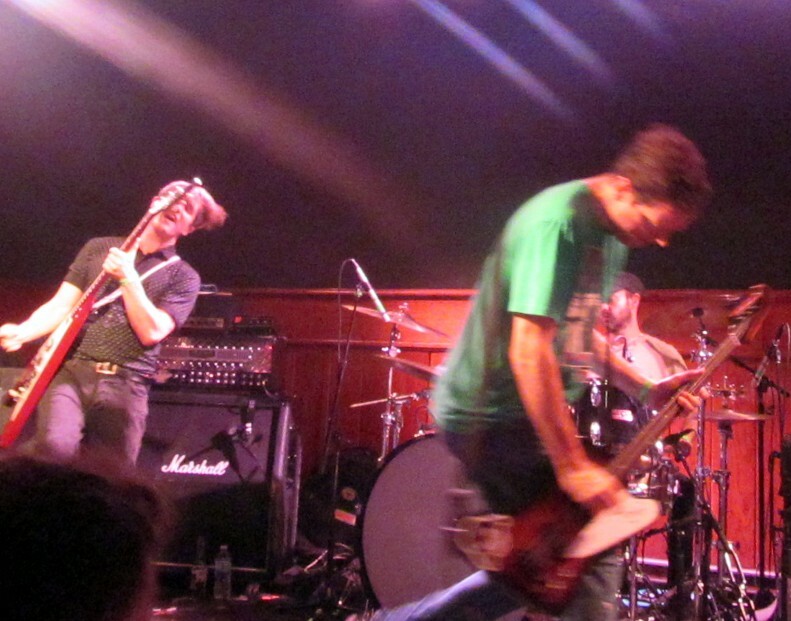 As I say repeatedly, I wish there were more new guitar-driven rock bands that excited me. Perhaps there are and I just don't know them. But there also are likely many other bands such as Ash, around for awhile, largely or entirely unknown to me but rather fantastic. I've caught wind of a few fairly recently, such as Superchunk, but am always open to learning about more. 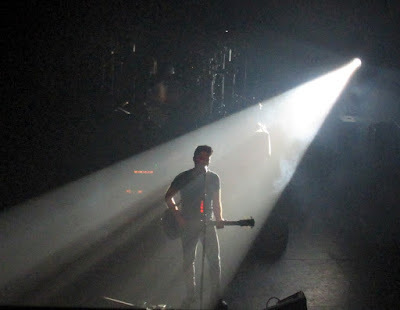 For while there are still many huge rock acts that I love--Bruce Springsteen, Paul McCartney, U2, Pearl Jam, Foo Fighters, etc.--nearly as fulfilling are the "personal favorites" such as Stereophonics and Ash. And as the past fortnight has proven, both continue to burn bright. A friend recently shared word of a refugee family from Africa who has relocated to a Midwestern American city after 20 years of waiting in a holding camp. 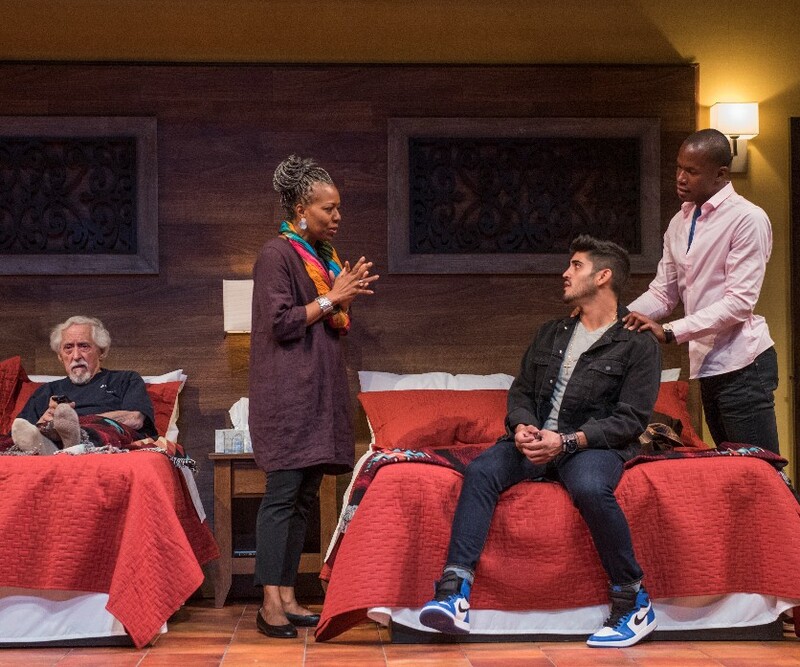 Although the specific circumstances are vastly different from those in Barbara Lebow's A Shayna Maidel--a play written in 1984, set in 1946 and largely referencing the 15 years prior--I couldn't help think of the African family as I watched TimeLine Theatre's excellent production. Quite empathetic to immigrants (legal and illegal) and especially refugees--I find the numbers about vastly declining U.S. admissions rather shameful--I try to imagine what the specific family of seven must be facing...and already has. It seems they are being welcomed by a warm community, their acclimation hopefully abetted by a sizable group of prior immigrants from their home country. Hopefully they will feel safe and warm, well-fed and largely away from anyone who might object to their being here, or express xenophobic hate. In time, the children will ideally get comfortable in local schools, the parents will be able to find work and friends, and through a combination of culture and camaraderie, the family will truly feel at home. Yet how could I or most anyone--even my friend, who has nobly engaged in social service activities in Central Africa--ever really have any idea what these people have gone through. And what must go through their minds. In A Shayna Maidel, a Polish immigrant named Rose Weiss (Bri Sudia, excellent here in a drama, as she's been in a number of musicals) lives alone in Brooklyn, physically and emotionally close to her overbearing father, Mordecai (Charles Stransky). The show's timeline had me a bit confused, but I think around 1930 or so, the dad brought Rose to America when she was just 4, leaving behind his wife and another, slightly older daughter, Luisa, who Rose now recalls only by name. Initially left in Poland due to an illness, and then due to choices Mordecai made during the depression, Luisa (wonderfully played by Maggie Scrantom as an understudy for Emily Berman at the performance I attended) wound up being sent to a Nazi concentration camp, as did her mother, husband and other relatives. 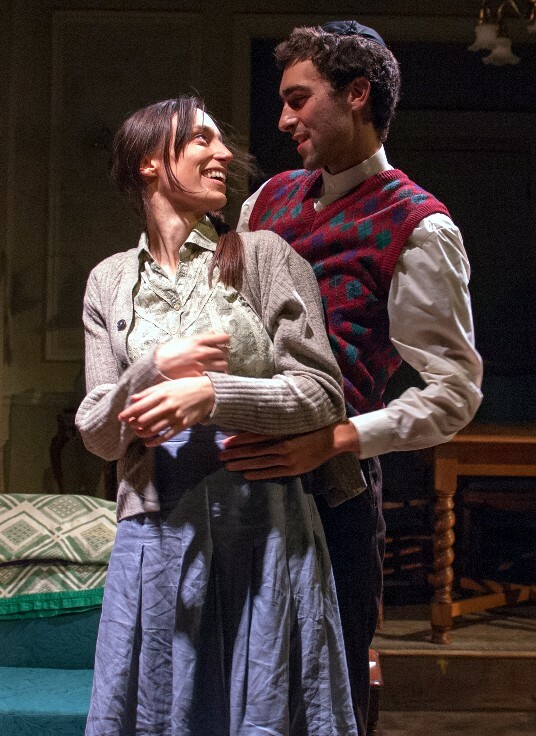 But as A Shayna Maidel opens, in 1946, Mordecai wakes Rose up with the news that Luisa somehow survived the Holocaust and will soon be arriving in New York. This news shocks and delights Rose, but also initially flusters her, as her papa insists that Luisa stay with her, in the one-bedroom apartment that makes for a striking, static set piece by Collette Pollard. Not only did Rose never consciously know Luisa in Poland, but even in adjusting to the cramped space, there are communication issues, including much that remains unspoken. Speaking with an accent and referring to Rose by her Polish name, Luisa becomes both fluent in English and openly talkative probably quicker than reality, but Scrantom was quite convincing in embodying her harrowed reticence. 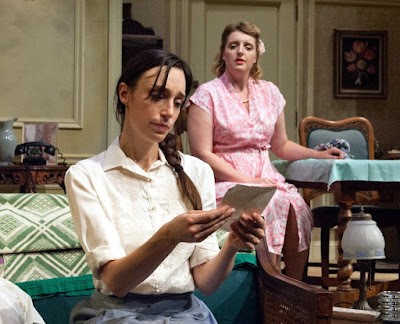 Luisa's husband Duvid (Alex Stein), friend Hanna (Sarah Wisterman) and her & Rose's mother (Carin Schapiro Silkaitis) are repeatedly seen onstage, often in flashback or memory scenes, and what happened to them before and during the Holocaust is part of the ongoing drama of A Shayna Maidel. 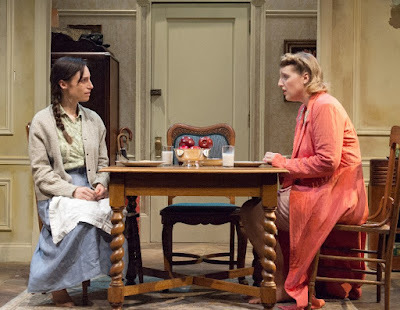 But although there are tough questions among the characters and considerable dramatic tension, the heart of A Shayna Maidel--which means "pretty girl" in Yiddish--is the reclaimed relationship between the sisters, who never really knew each other and have had vastly different experiences. 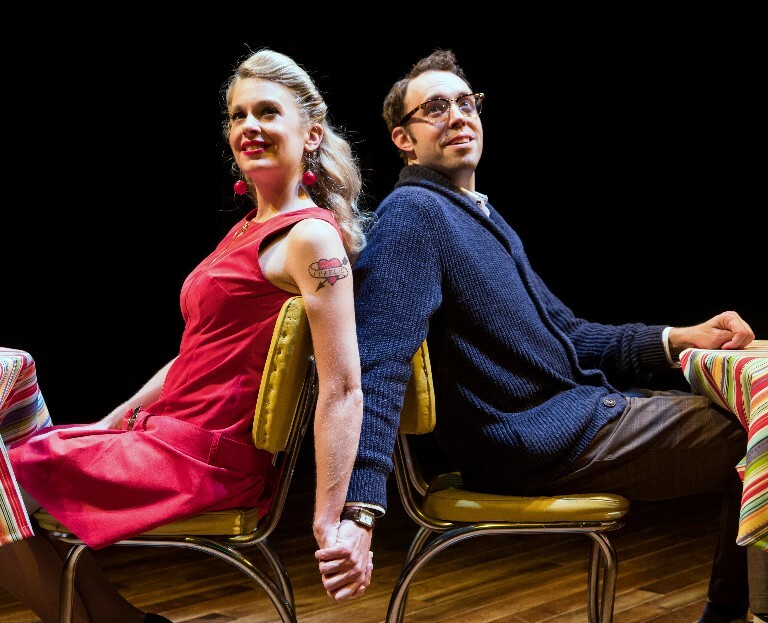 As noted above, I've seen Bri Sudia in multiple musicals, most recent being Wonderful Town at Goodman Theatre, a Leonard Bernstein musical about young adult sisters living in and discovering New York City after relocating from Ohio. So I couldn't help but think of that coincidence in terms of similarities and vast differences, not just in terms of the shows, but the sisters. And beyond the graver side of A Shayna Maidel is a sisterly sweetness as Rose tries to introduce Luisa to modern fashions, hairstyles, and more, with a good bit of humor and commiseration, including regarding their harsh father. This isn't so unlike Wonderful Town. But the grief, horror, memories, images, thankfulness, trepidation, fear, bewilderment and much else undoubtedly going through Luisa's head are almost unfathomable for me--or presumably most anyone, including Rose--to imagine, let alone truly know. Which prompted made me think compassionately about the African refugees my friend recently helped welcome to America, and others akin. Yet while Rose--who seemingly grew up comfortably in Brooklyn, though remains single and struggling a bit professionally--has seemingly had things much easier, her mental anxiety must also be substantial. To have been safe knowing your mom and sister were in peril, to have--once the extent of Hitler's depravity became well-known--imagined about what they must have experienced, to have presumed them and many other loved ones perished, to have conceivably felt great guilt for your good fortune and to now have your sister--an embodiment of all of the above--living in your home, well, that's gotta be a mind-f*ck. And a big part of what makes A Shayna Maidel so fascinating--as directed at TimeLine by Vanessa Stalling--is in what is never said. What must these two young women be thinking? Beyond a few nightmares that are depicted, how can they possibly sleep at night? What must it be like for Luisa to ride a crowded train, as she commutes to a job with an immigrants' aid agency. And what can it possibly be like to be a kid put in a cage, separated from your mom and/or dad, at the U.S. border? What must it feel like to be the mom or dad? What might the experience--internal and external--be for African children who have spent their entire lives in holding camps to find themselves in classrooms with kids who have grown up with Happy Meals and iPhones and Pixar films and Netflix? 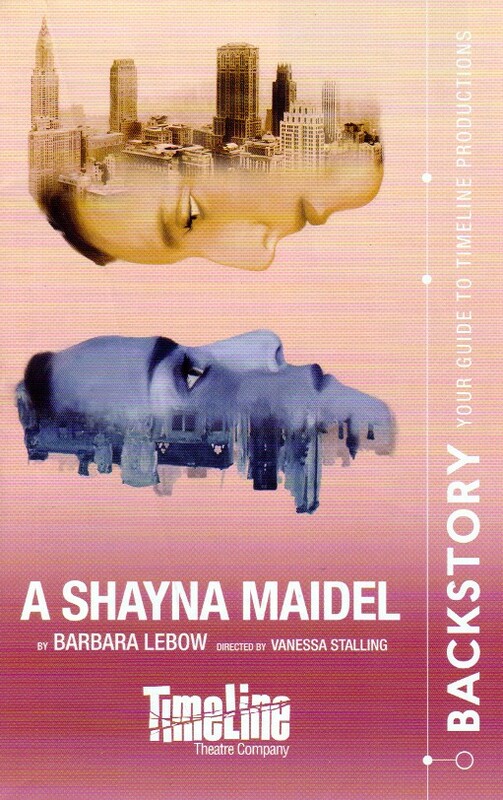 Due to some chronological and dramaturgical confusion, I can't quite dub A Shayna Maidel a perfect play, even with a splendid rendition by TimeLine. But like great theater should, it sure made think. Including about things largely unthinkable. This isn't infallible--nor are my critical instincts overall--but I can usually get a pretty good sense of the quality of a new musical in its first 15 minutes. Certainly, my overall judgment--and rating on a @@@@@ scale--is based on a show in full, and there are some that start strong and then fade, and others that greatly supersede a so-so beginning. 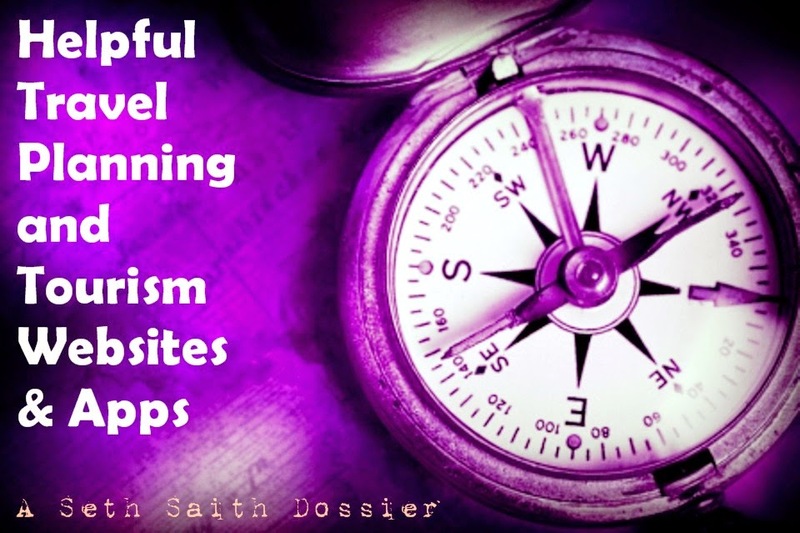 But having seen over 400 different musicals, with probably 75% of them reviewed on Seth Saith over the past 15 years--including many World Premieres heading to Broadway--there is something somewhat intangible about the best ones that just feels great, from the get-go. So while I will candidly note that I saw Tootsie's third ever public performance, officially a preview at which there was a technical snafu, and appreciate that there will be ongoing adjustments made until the official Opening Night, probably throughout the Chicago run, as the show preps for Broadway next year and in previews there, I'm comfortable in conveying that the show begins by feeling like something special--and stays that way. Over the past year, I've attended 11 world premiere musicals, including Tony-winner The Band's Visit on Broadway--David Yazbek wrote the music and lyrics for that show and Tootsie--as well as Pretty Woman, Trevor, The Cher Show, Heartbreak Hotel and Moulin Rouge!, and I liked Tootsie more than any except Moulin Rouge!, which I happened to catch on a trip to Boston. Again with the caveat about seeing it early in previews, I don't perceive that Tootsie will quite rank with the very best musicals ever created, but it gets pretty much everything right. Even my middling review of Pretty Woman, based on seeing the very first preview in Chicago earlier this year, has largely been echoed by reviews of the Broadway run (in spite of which, it is doing great box office). 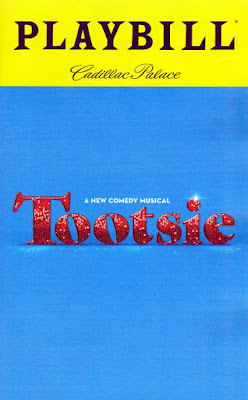 Funny thing about Tootsie, which, like the 1982 movie, is very funny, its opening number--no song titles are provided in the Playbill, and as you can see, no show photos are yet available--initially seemed like nothing special, but this sense was adroitly validated, and reversed, almost instantly. 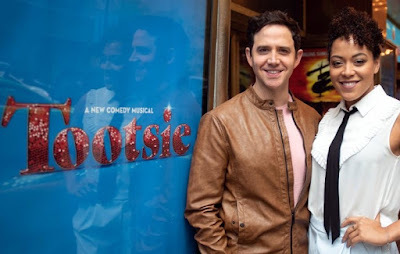 I won't spell out many revelatory details, but the most obvious deviation from the movie is that out-of-work actor Michael Dorsey (the fantastic Santino Fontana) passes himself off as Dorothy Michaels not in a daytime soap opera, but in a Broadway musical. This change works quite well, as does basing the musical in the here and now, not the early '80s when there was considerably less sensitivity--not that it's anywhere near perfect now--about gender identity, sexual orientation, etc. 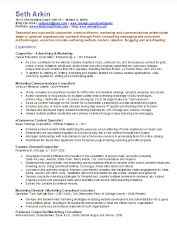 The script by Robert Horn, under the direction of Scott Ellis, makes it quite clear that Michael is a straight man who assumes a woman's identity strictly to get work...and comes to realize it's dunderheaded decision, hurtful to those he cares about (and likely insulting to non-cisgender individuals, though this isn't acutely addressed). As befits a show that needs to balance LOL humor with a good bit of delicacy, Yazbek again shows himself to be a shrewd songwriter. 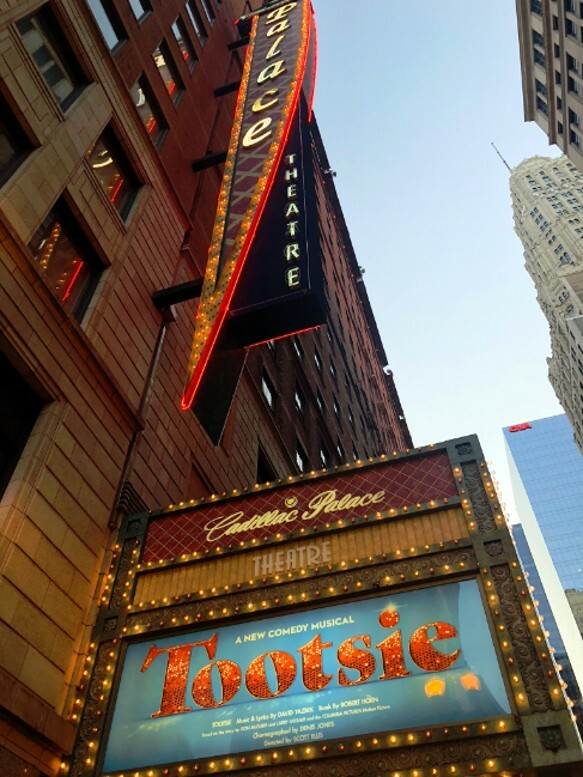 Though Yazbek's The Full Monty, Dirty Rotten Scoundrels and The Band's Visit--which I didn't quite love--were all good musicals, even on a first encounter I perceive Tootsie to be his best work yet. Still, overtly hummable melodicism isn't Yazbek's foremost strength, and just three days after seeing Tootsie, I'm hard pressed to recall specific songs (made harder without a song list, though I did jot some notes). As Sandy, Michael's platonic actress friend (played by Teri Garr in the movie), Sarah Stiles brilliantly delivers a 200mph ode to the neuroses of a constantly auditioning performer, while Fontana, terrifically overcoming the challenge of inhabiting two of Dustin Hoffman's more iconic roles, demonstrates great pipes in a song presumably titled "All In." 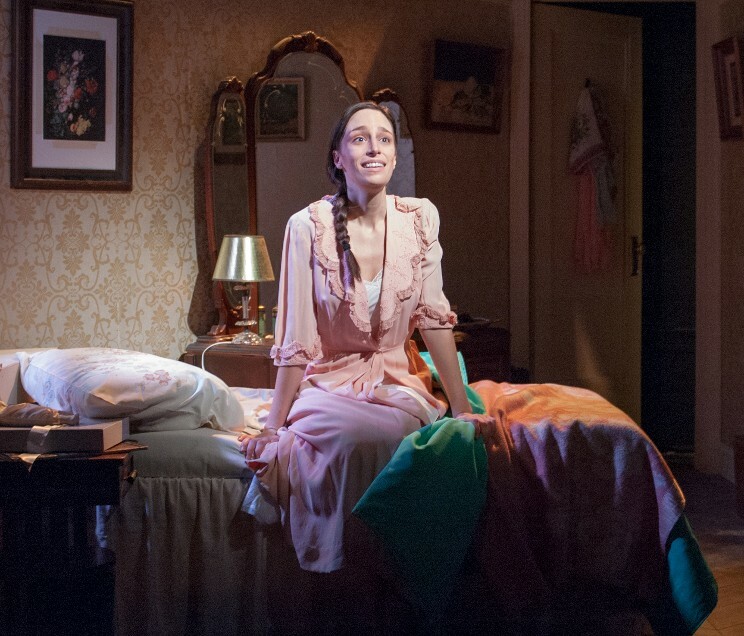 Lilli Cooper (Julie, the Jessica Lange part) also clearly possesses one of those remarkable Broadway-star voices, and all of the performances and production values are truly first-rate. Even though a song like "Unstoppable"(??) isn't the best Act I closer one can imagine, the production number surrounding it, with choreography by Denis Jones, makes it a highlight. 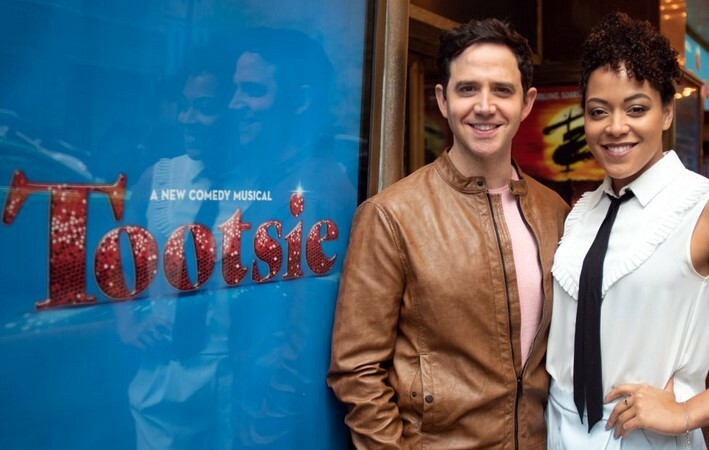 As befits a show already booked into Broadway's Marquis Theatre next spring, Tootsie is bursting with great talent throughout its cast. Beyond the aforementioned, Andy Grotelueschen is wonderful as Jeff, Michael's roommate and close friend, especially as he makes the role his own, not faux Bill Murray from the movie. He sings an early Act II song I'll let you encounter with surprise, but it's a delight. Reg Rogers (as Ron Carlisle, the director of the show within the show), John Behlmann (Max, a star of the show who becomes enamored with Dorothy and serenades her hilariously on "This Thing"), Julie Halson (Rita, the show's producer) and Michael McGrath (Michael's agent Stan) are all demonstrably good. 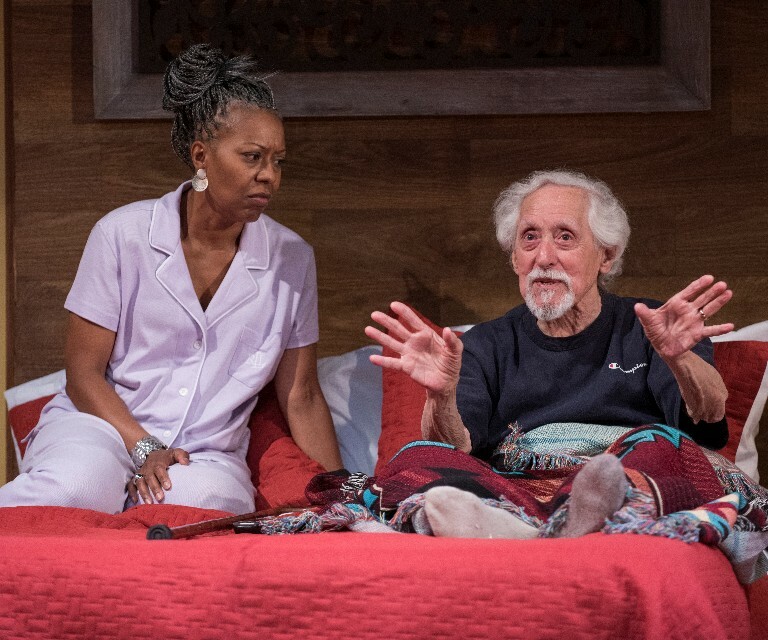 Fontana does an excellent job both as Michael and Dorothy, but if there is a way for him--over time, let's be fair--to make the latter feel more his own incarnation and less overtly reminiscent of Hoffman's characterization (or Dana Carvey's Church Lady), I think it would help a little. 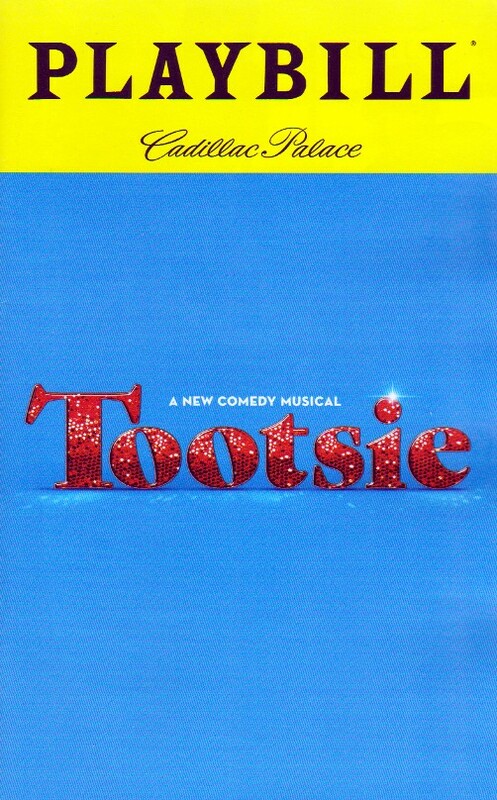 But as it stands quite early in its public gestation, Tootsie is a winner. Although it comes at a point when I was tiring of (often creatively tepid) movie-to-musical adaptations, this show--with updated twists on the film's humorous conceit, fine songs, singing, dancing and acting, much delightful dialogue and even a nice sense of morality--really gets it right. 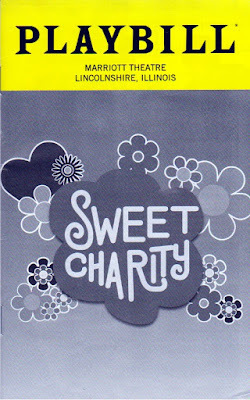 Some of the greatest names in the annals of entertainment history are connected to the 1966 musical, Sweet Charity. Federico Fellini directed the film--Nights of Cabira--on which it is based. Bob Fosse conceived, directed and choreographed the Broadway premiere. Neil Simon wrote the book (i.e. script), Cy Coleman the music, Dorothy Fields the lyrics. Gwen Verdon starred on Broadway with John McMartin, who reprised his role in the Fosse-directed film version alongside Shirley MacLaine. And in Marriott Theatre's new production, estimable talent also abounds, with several of the cast members bringing impressive Broadway credits. In the title role, Anne Horak--who has played Roxie Hart in Chicago on Broadway--is excellent, and eminently likable. Local stalwarts Alex Goodrich (Oscar), Terry Hamilton (Herman) and Alexandra Palkovic (Ursula) are terrific. Kenny Ingram (Daddy Brubeck) and Adam Jacobs (Vittorio Vidal) are Marriott vets who have enjoyed fine Broadway careers; the former notably in The Lion King for 15 years, the latter in that show, Les Misérables and the title role of Aladdin. Dani Spieler (Nickie), who has been in several Broadway shows and National Tours, is delightful, as is Natonia Monét (Helene), who I felt could have made for an intriguing Charity. The score includes a number of great songs--"Big Spender," "If My Friends Could See Me Now," "There's Gotta Be Something Better Than This," "I'm the Bravest Individual," "Sweet Charity," "I Love to Cry at Weddings"--and there is much fine choreography under the auspices of director Alex Sanchez. There are also many funny lines of dialogue courtesy of the legendary--and just recently passed--playwright Neil Simon. Goodrich, in particular is hilarious, and has great chemistry with Horak. 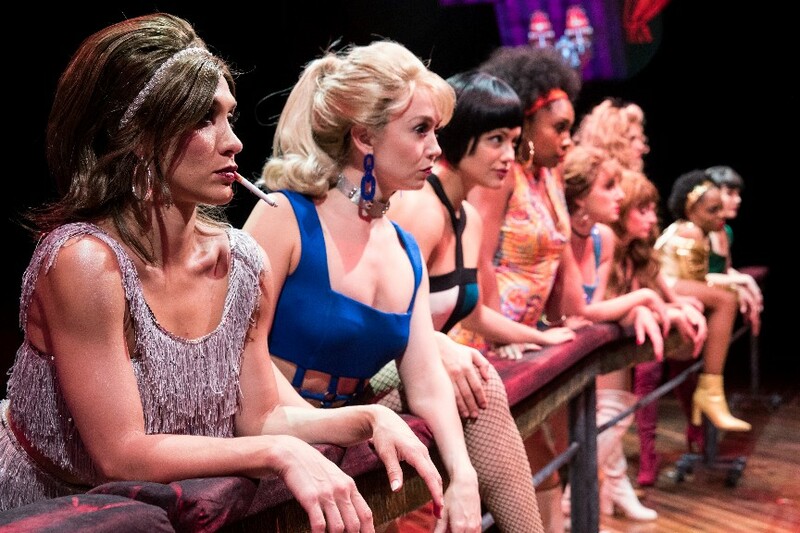 Yet for all that it has going for it, historically and currently, Sweet Charity is fun but well short of fantastic. My sense is that, despite the esteemed creators and several fine songs, the source material is to blame far more than any deficiencies at Marriott. I've only seen Sweet Charity once before, starring Christina Applegate, in Chicago on its way to a Broadway revival in 2005. I wasn't penning full blog reviews then, but in my Shows Seen database, gave it 7/10, so the equivalent of @@@1/2 here. 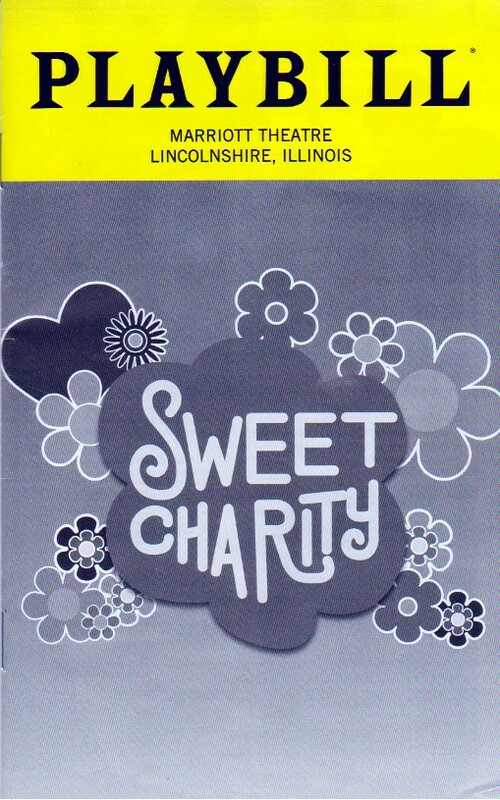 And while Sweet Charity is a famed title in the canon of classic Broadway musicals, the original production won just one of the nine Tony Awards for which it was nominated (for Fosse's choreography). So while charms are abundant at Marriott, so too are likely inherent flaws. In Nights of Cabiria, the central character is a Rome prostitute--named Cabiria and played by Giulietta Masina--who searches for true love in vain. That's essentially the desire of Charity Hope Valentine in the musical, but in 1966 America, her profession was adjusted to that of dance hall hostess, also known as a taxi dancer (though still essentially a girl for hire). While director Sanchez, star Horak and others involved at Marriott have expressly aimed to be sensitive to today's #MeToo movement, playing up Charity's strength vs. any degradation she faces, the core conceit feels dated and she too romantically desperate. And despite considerable tunefulness by composer Cy Coleman and many cheeky lyrics from Dorothy Fields that make most of the songs individual delights, Sweet Charity really doesn't flow all that well. 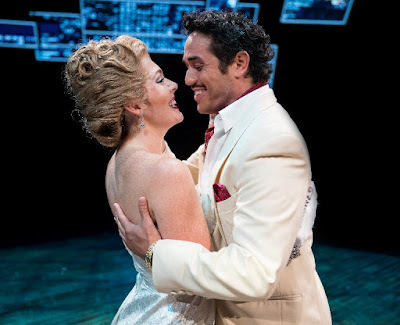 Sanchez's choreography can aptly be called a strength of this production, particularly during "Big Spender," but skillful dancing can't prevent Act I's "Rich Man's Frug" from feeling unnecessarily long without adding anything to the show's narrative. A few other numbers tend to lag as well and/or come off as too capsulized. Adam Jacobs is great fun as Vittorio Vidal, with his rich voice resounding on "Too Many Tomorrow's," but--unless I just didn't recognize the actor in other scenes--he's woefully underutilized. 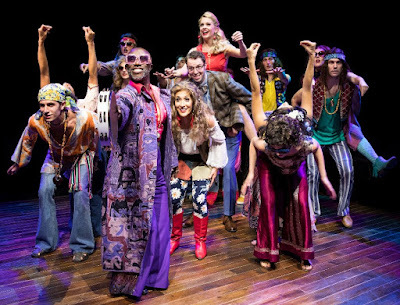 Likewise, it's a joy seeing Kenny Ingram lead a congregation of hippie followers in "The Rhythm of Life," but it too is a relatively small role in a scene that, despite Felliniesque trappings, feels a bit forced. Dani Spieler and Natonia Monét delectably make the most of their stage time as Charity's dance hall colleagues and confidants, and Sweet Charity hits its high mark when Alex Goodrich shows up as Oscar, a nebbish who aims to win Charity's heart. Goodrich made meet laugh out loud as Oscar meets Charity in an elevator, and his interactions with Horak are delightful, as their characters ping-pong each other's neuroses. So as I noted above, there is much great talent at work in the round at Marriott Theatre, and a whole lot to like about Sweet Charity. It's just that its many fine parts wind up greater than the whole. I love many of the biggest artists in rock history, across all eras: Elvis Presley, Bob Dylan, The Beatles, The Rolling Stones, The Who, Led Zeppelin, Elton John, David Bowie, Bruce Springsteen, AC/DC, Prince, Nirvana, Green Day and hundreds more. An avid concertgoer, just this year I've attended several shows by "household names" (or close to it): U2, Pearl Jam, Foo Fighters, Billy Joel, Journey, Def Leppard, Robert Plant, Neil Young, Radiohead, ELO, Jethro Tull, Steve Winwood, Depeche Mode, David Byrne, The Killers, Arcade Fire, Smashing Pumpkins, even Taylor Swift. But like everyone--or at least everyone who takes music somewhat seriously, as borne out by virtually every iTunes library I've ever seen--I also cherish several rock acts that can be considered more personal favorites. Obviously, the music other people may know and appreciate varies greatly and is hard to presume or generalize, but I'm guessing there are many music lovers today who have never heard of The Zombies, The Jam, Dinosaur Jr. or Bob Mould, let alone Alejandro Escovedo, Willie Nile, Maximo Park, Ash or The Wildhearts. 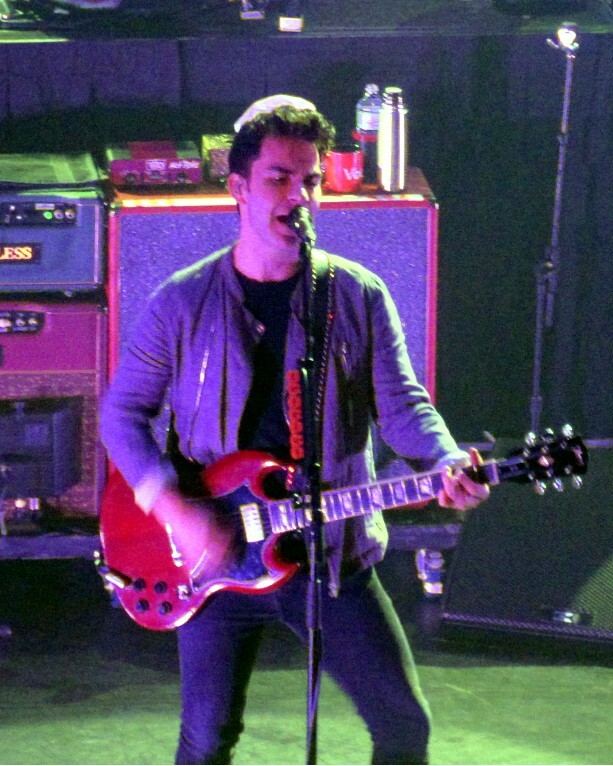 Hailing from Wales, the Stereophonics are likely my #1 still active "personal favorite," a recognition they only enhanced with a fantastic concert Tuesday night at the Vic Theatre in Chicago. Around the year 2000, with new rock seemingly in a doldrums--it still is, but that's another story--I did a bit of internet searching for bands who were popular in Britain but unknown to me and much of the U.S. There have been many of these over the years, from the Move to the Jam to Suede, Blur, Pulp and dozens of others I once compiled into a Hidden in the Isles box set. Presumably with the aid of Napster, I instantly fell in love with what I heard from the second Stereophonics album, 1999's Performance and Cocktails, including "Roll Up and Shine" and "The Bartender and the Thief." I soon bought it, and then also got the band's 1997's debut, Word Gets Around, which I liked even more. 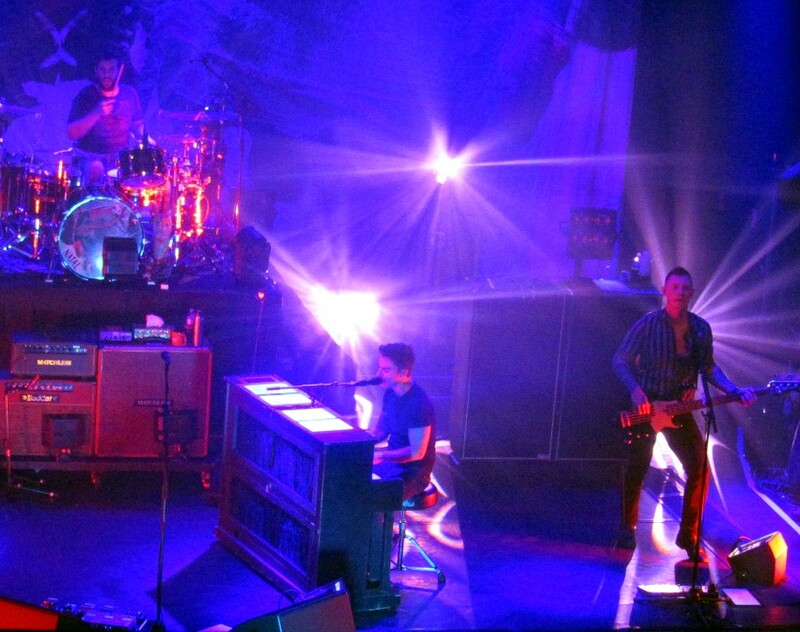 At the time, and ever since, Stereophonics have been playing arenas & stadiums at home--they've had six #1 albums in the UK--and headlining huge British festivals like Glastonbury, Reading and the Isle of Wight. But for whatever reason, they've never made much of a dent in the U.S. I first saw them do an acoustic show at Chicago's Double Door in 2001, have seen them three times at Metro, attended a show at the Congress Theater that they co-headlined with Howie Day and in December 2003--within a few days of their playing a massive gig at Millennium Stadium in Cardiff, Wales--I saw them play a WXRT holiday concert at the Cubby Bear. Thanks to my friend Josh knowing someone from WXRT Radio, after that show we were able hang out with the band upstairs, and I met singer/guitarist/songwriter Kelly Jones and bassist Richard Jones, who is not related. A thrill for me, yes, but I've always wondered how the Stereophonics have dealt with the vast dichotomy of fame on both sides of the Atlantic. 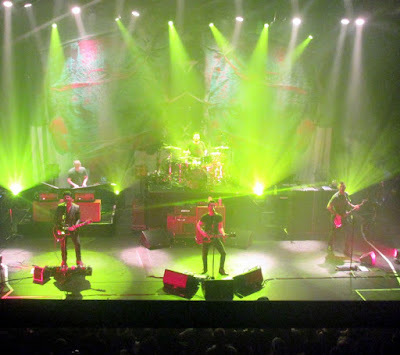 Still, in buying tickets to their Vic show as soon as it went on sale in March--it wound up being well short of sold out--I was surprised that it had been 10 years since I last saw the Stereophonics live. My common concert pal Paolo was happy to join me, and Josh and his wife--who I credit myself for converting to a rabid fan--happened to get seats right nearby. 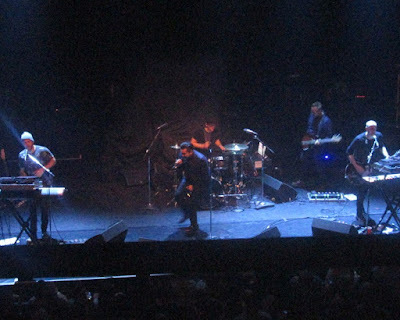 The show was opened by a British band I hadn't heard of called the Ramona Flowers, and Paolo and I instantly agreed that they had a nice sound that reminded of the New Romantic mid-'80's era--Spandau Ballet, OMD, Culture Club, Psychedelic Furs, etc.--without being outright derivative. With slicked-back hair and black suit, singer Steve Bird conjured up Spandau Ballet's Tony Hadley, as well as Bryan Ferry, at times alternating nicely between croon and falsetto. 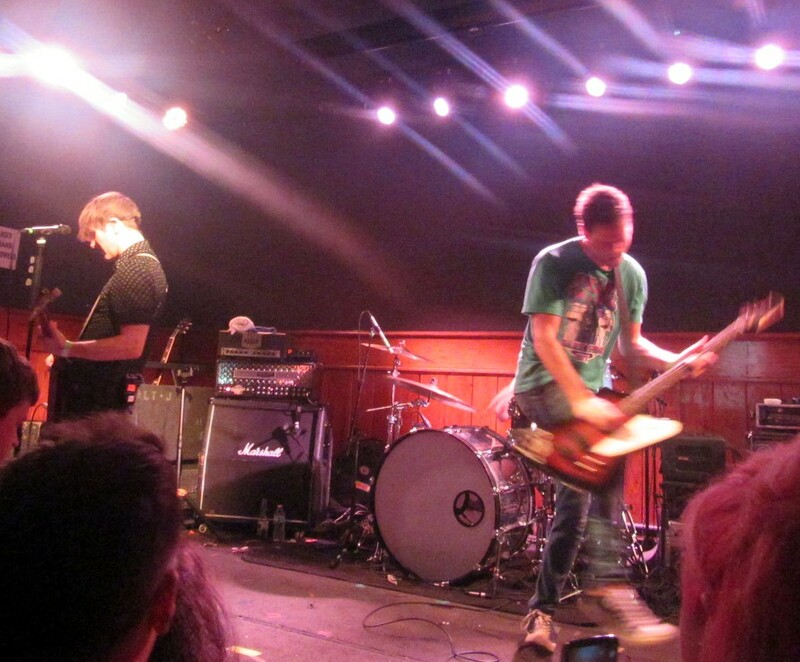 I can't name any of the songs they played, but enjoyed several, and you can find The Ramona Flowers on Spotify. At 8:30pm, the Stereophonics took the stage with a song called "C'est La Vie," and though Kelly Jones' voice has always had a bit of Rod Stewart raspiness to it, at age 44, it still sounds great. After "Caught by the Wind," the opener of 2017's Scream Above the Sounds, came "A Thousand Trees," from Word Gets Around and still the most powerful song I've ever heard broach the topic of child molestation. Thirty songs would be played across a robust 2-1/2 hours, with at least one from all 10 studio albums. Quite pleasing to me, nine tunes came off the first two Stereophonics albums--including "Too Many Sandwiches," "Plastic California," "Same Size Feet," "Traffic" and "Just Looking"--and even a few more would have been welcome. But although I started to sense a bit of sameness to some of the material midway through, in full the Stereophonics accomplished everything a great concert should. 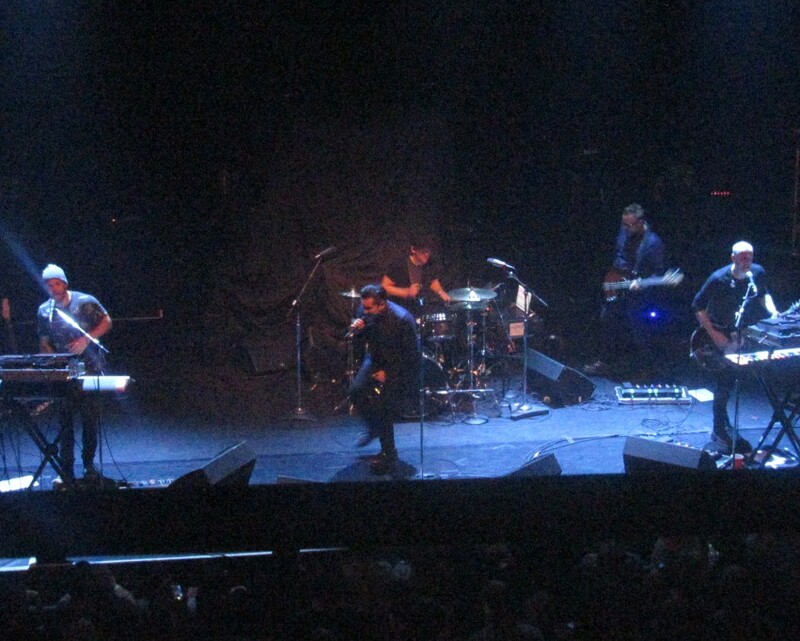 There was a stellar opening act and the headliners played a generous but not overindulgent show, without repeating exactly what had been played the night before in Toronto. Songs I knowingly love sounded fantastic, including "A Thousand Trees," "Have a Nice Day," the closing "Dakota" and the phenomenal "Local Boy in the Photograph," a deceptively blistering yet wistful rocker about a young man who threw himself in front of a train. Songs I only kinda knew--"Geronimo," "I Wanna Get Lost With You," "Sunny"--came across well, and a few I had never known or long-forgotten--"Daisy Lane," "Drowning," "Live 'n' Love"--were passionately delivered in a way that had me looking them up afterward. Kelly Jones let the crowd--including presumably numerous UK expats who knew the material well--sing along lustily to enhance "Maybe Tomorrow," while drummer Jamie Morrison (the band's third) delectably powered through a few extended codas. They even then, after "Dakota," rocked through "Sweet Home Chicago" in a way so surprising it didn't feel trite or pandering. Just in case the band reads this, I'll cite a couple of other tunes I would've relished hearing--"Roll Up and Shine" and "Billy Davey's Daughter"--but this is meant only as a wish for next time and in no way a gripe. 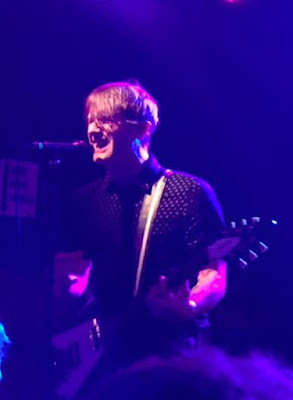 I wound up a wonderful night with no reason not to award @@@@@ on my 5@ scale, and although I sense this show may not be at the very top of my Best of 2018, there is something special about one of your personal favorite bands proving one's affinity well-warranted all these years down the road. And even amplifying it anew.